It’s April 18th and I have yet to see hide or hair of the promised tax refund. It’s also Friday, a full two days later than I usually take my shirts to the drycleaner for the special. With both of those facts in mind, let’s go on to today’s post. It is said that Beau Brummel used to send his shirts to the countryside to be laundered so that they were returned to London smelling of fresh air. I imagine that they were pressed for him also. For those of us not fortunate enough to have staff, or those who prefer to prolong the life of a shirt, it is highly recommended that we launder and iron at home. The laundering is a two day process, if done with an attention to detail, and involves old fashioned soaps like Borax and a nail brush. But that’s another story and one that I am unprepared to tackle as my level of insanity hasn’t reached that point. Yet. 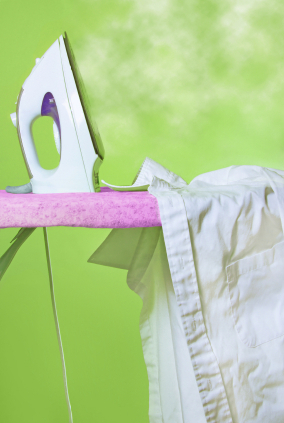 A clean, white cover on the ironing board and a clean white towel to test that the iron isn’t spitting brown gunk will save you hours of anguish. It’s OK to stretch the cloth a little while you’re ironing. When you’re finished, hang the shirt on a hangar and button the buttons. At least the top four, if not all, please. 1. Press the cuffs, beginning inside and then lightly pressing the outside. Go easy around the buttons and edges. Press the sleeve placket and then shape into the barrel and button the cuff. For French cuffs my (now former) cleaners used little plastic clips to secure the doubled over cuff and keep it round. You may use a plastic tie from the sandwich bags or trash bags. 2. Press the sleeves. I start by stretching the sleeve out and laying it on the board with the underarm seam toward me. I smooth out the sleeve trying to remove the wrinkles from both sides of the cloth at once. Holding the cuff, I work my way toward the body of the shirt on the seam, pressing it flat. If I need to repress out a wrinkle I caused, I squirt with some distilled water first. Now that you have a baseline fro which to work, smooth out the sleeve again with your hand, starting at the seam and smoothing upward. The press in the same manner. Press in the pleats at the cuff. One of which will wind up being the top crease of your sleeve. 4. Next press the side seams from the inside of the shirt. You are going to lightly stretch the shirt from the hem while doing this. 5. Now it’s time for the front. Press first the inside of the buttonhole placket, then the inside of the buttons on the other side of the shirt. Flip them facing up and lightly press the buttonside, working around the buttons. Stretch the buttonhole side using your hand at the neck and the iron at the hem. Firmly press the buttonholes. 6. Shake out the shirt and lay it so that one half of the inside is facing you. Press the inside of the shirt all the way up to the yoke. Repeat for the other half. 7. Flip the shirt right side in. Iron the back from the hem to the collar. Press the pleats towards the shoulders. The yolk is pressed after laying it over the pointed end of the board. 8. Very firmly press the inside of the collar band again. And now I do the outside of the collar from point to point, careful at the edges not to catch them in the steam holes. Fold the collar and press in the fold. 9. Press the fronts again, just to make sure. 10. Put the $2-$3/shirt that you’ve just saved into your easy and elegant life interest bearing checking account. This entry was posted in Living and tagged clothing care, Living. Bookmark the permalink. 12 Responses to Well, Shirt! Having recently discovered your delightful site, I wished to comment about laundry and ironing. The very best whitener I have ever used and one that is people and environmentally friendly is Ecover ecological non chlorine dry laundry bleach. It is superb for lifting wine stains as well. (Simply make a paste with cold water plus the Ecover bleach and let sit for a while.) I also hope that you have discovered the wonder of owning a Rowenta iron. I have always ironed clothes and linens, but never experienced (what I thought to be) truly professional results until purchasing this appliance 10 years ago. It makes all the difference, and with ease. Many thanks for your daily posts from a Richmond native who presently dwells in Washington State, the area of many choices for delicious wines! Welcome Gloria, and thanks for the hints! I confess, my iron spit out some left over starch (napkins) and streaked a shirt (even after I checked it on my towel, etc.) In a fit of pique, I took them all to a hand laundry for ironing. Horribly expensive and a week to wait. Think I’ll look into that Rowenta. My dear husband gave me a glorious extra wide ironing board. It is one of my favorite chores. A toss up with polishing silver! Mrs. PvE, an extra wide ironing board? Where does one find such a thing? That and a sleeve form would really simplify my life. I love it! I have the Ironing sleeve form too which I also use a lot! I love ironing also; surely there is a psychological reason for this? I like to think of it as orderly and mindless at the same time. I love ironing, too… I think it’s an instant gratification thing. I just bought a Rowenta iron this morning. I’d had enough of the spitting, shedding one I’ve been using. Aesthete, there is a certain Zen to ironing after awhile. Oh dear, my ironing table was not 2,000. Please look at Kitchen Source, wide ironing board. Oh I know Mrs. PvE, that was for the one that does everything but work the iron for you. What a strange thing to wind up coveting at this point in life…. it should be a gull-wing Mercedes or something. This blog is wonderful and has been so helpful to me as a college student in California. I’m curious if you could however elaborate on your at home laundering process? Only recently have I purchased any shirts and I would prefer to care for them myself at home. Any advice would be greatly apreciated, and again thank you for the time you put into this blog. Hello Taylor and thank you for the compliment. I’m glad you find the blog useful. The absolute best article on shirt care (warning: it’s involved) is here: http://www.customshirt1.com/ShirtLaundering.html I have begun to take mine to a coin laundry where they hand iron. I’ll sometimes wash (Tide w/ Bleach Alternative and OxyClean powder) or spotclean them with OxyClean spray and then have them done. Thanks for the question!